View More In Grill Pans - Page 4. 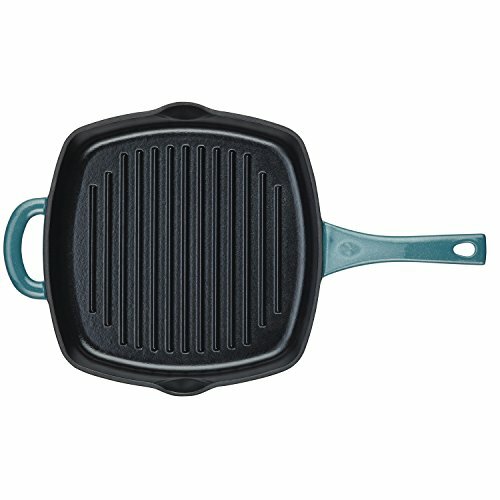 Constructed from durable, virgin ore cast iron, this skillet is ideal for cooking on any surface including gas and induction and is perfect for searing up healthy skinless rosemary chicken breasts to pair with white cheddar mac or for pulling off Ayesha's Easy Pan Steaks for a sophisticated mid-week feast. The cast iron body features matte black enamel on the pan's interior for great searing and browning and a glossy metallic fleck enamel on the pan's exterior for a modern countertop style accent. Plus, the pan's raised edges provide plenty of room for one pot meals. A solid main handle and smaller helper handle make it practically effortless to pull together crispy, juicy pork chops and apples on the stovetop and then move them right to the oven, where the skillet is safe to 500 degrees F.